Here’s a great recipe to satisfy both your meatless urges and your desire for a good burger. I’ve got a great recipe for oat burgers that taste so good, I’ve even faked out picky eating kids, thinking they were eating the real (meat) thing! I’ve been making them for years. These burgers have a way better consistency than any of the bean burger recipes I’ve tried that seem to be a bit too gooey and mushy for my tastes. 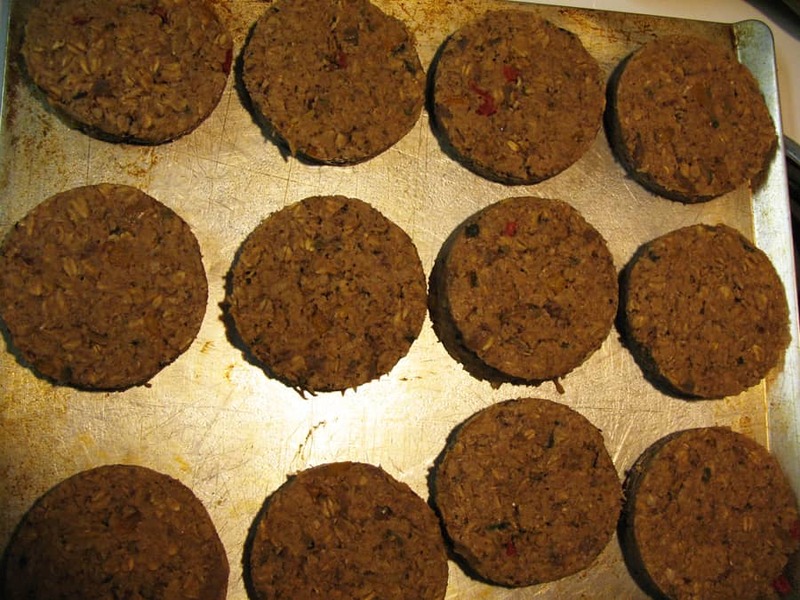 Oat burgers remind me more of meatloaf, less of gooey n0n-meat-and-you-can-tell beanie varieties. Every time I make a batch of oat burgers, I vary them a bit. I use whatever vegetables I have on hand, or season them according to my current craving (i.e. maybe they’ll be regular burgers, maybe they’ll have a Mexican flare, etc). I also make at least a double batch. They freeze really well and can be pulled out one at a time as needed. Oat burgers ready to go into the oven. First, finely chop some vegetables of your choice. I vary the veggies, but always use onions and garlic. I also often use mushrooms and shredded carrots or zucchini. You’ll need about 1.5-2 cups of these veggies. Sauté them until they’re tender. Season with any spices you like—basil, cumin, coriander, salt, pepper, Mexican seasoning, etc. Bring this mixture to a boil. Stir in 4 cups rolled oats (not quick cook!) Remove pot from heat, cover and let sit until contents are cool enough to handle. From there, form into patties. Place on a lightly greased cookie sheet. Bake at 350 degrees for about 15 minutes per side (or longer, depending on the ‘doneness’ you like your burgers). They can be eaten like this, or throw on the grill or into a frying pan for some ‘finishing’. Add all your normal hamburger fixings and you’ve got a great meatless burger! Depending on how big and thick you make your burgers, you’ll get 10 or more burgers from one batch. Mmmmm. I think I need to go light the Barbie!